In the Constellation of the Earth project, we draw large geoglyphs using an Earth observation satellite and aim to share a new view of Earth from the perspective of outer space. In our works in Japan and experimental works in overseas, participants drew “stars” in their city by placing reflectors on the ground and brightening the pixels in the satellite image. Each of our works is created within a certain area, such as the whole city, and the many “stars” drawn simultaneously by its citizens constitute a “constellation.” The sizes of the constellations occasionally reach several tens of kilometers on the ground, and the number of participants often reaches hundreds. Image acquisition over such large areas is enabled by the satellite Advanced Land Observing Satellite-2 (ALOS-2), which was developed and is operated by the Japan Aerospace Exploration Agency (JAXA). To create our works, we first investigate the image acquisition schedule from the satellite operation plan and then conduct creation activities on the ground based on this schedule. The data obtained by the satellite are received at one of the many satellite communication facilities all over the world, low-level processed (image decoding, etc.) at JAXA, and then processed into an art work by Suzuki and Ohki of this project. The main purpose of ALOS-2 is to gather images for disaster monitoring, environmental conservation, resource management, and other scientific and practical applications. The use of this satellite to create art works is unusual. In fact, among over 700 research themes with the right to access ALOS-2 data, only our project has participated from the field of art. Even in this modern age, where earth observation satellites are operated as infrastructures and can be used by anyone following a certain procedure, artists still rarely use them. 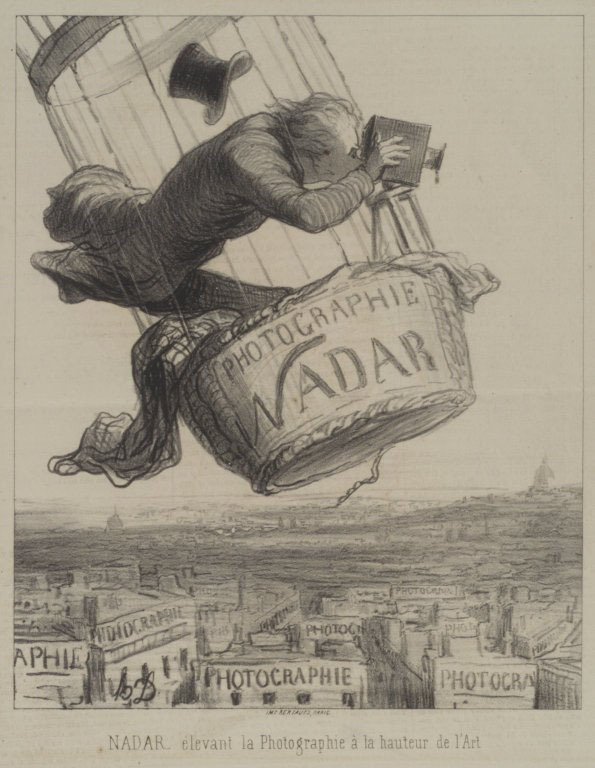 Nadar took a photograph of the perspective of Paris from his balloon, and it became the world’s first aerial photograph. Then, he took several aerial photographs over Paris, one after another, and surprised citizens by bringing a new view of the cityscape to them. Science, technology, and art are linked in the formation of viewpoints from a higher altitude, space. In 1880, astronomer Camille Flammarion drew an imaginary picture of the Earth as seen from the lunar surface in his book based on scientific considerations. In 1902, the same outline of Earth was drawn in the SF movie A Trip to the Moon by Méliès. In the color film of the movie, however, Earth was portrayed in yellow. After the first manned space flight was realized in the 1950s, a blue Earth was more often described by astronauts’ words and photographs, and artists began to draw Earth in blue. In particular, a photograph of Earth rising from the horizon of the moon, which was taken by the Apollo, impacted many people and contributed to the formation and distribution of a modern world view, which is symbolized by Buckminster Fuller’s Spaceship Earth. Higher altitudes, such as the sky and space, have been explored by scientists and engineers to discover new knowledge, as well as by artists to discover new artistic expressions. When the concepts of science, technology, and art expand, no difference between their behaviors can be observed. We recognize this in our project. Grasping changes of the ground from space, which is a distance higher than that experienced by Nadar, and turning them into art work is difficult. Science technology and art are in close conjunction in all processes when creating our works. In Constellation of the Earth, we draw geoglyphs and capture them using synthetic aperture radar (SAR) equipment mounted aboard the satellite ALOS-2. SAR is a widely used imaging device that emits radio waves to the ground and creates images using the reflected waves. The main characteristics of SAR are imaging with invisible radio waves instead of visible light and emitting radio waves instead of using other light source such as sunlight. The predecessor of the Constellation of the Earth project, Satellite Art Project Kanazawa by the Kanazawa College of Art, formerly used another satellite carrying optical cameras. Similar to human eyes, an optical camera uses sunlight as a light source to photograph the ground surface. Satellite images used in Google Earth are also captured by this principle. However, this method cannot image the ground surface under clouds. Since images may not be obtained during inclement weather, the technique is unsuitable for activities with a large number of participants. By contrast, SAR uses radio waves that can penetrate clouds and rain and obtain ground images regardless of the weather. Thus, the former project was modified to use the ALOS satellite, which was equipped with a SAR; unfortunately, the operation of this satellite was terminated in 2011. As its successor, the ALOS-2 was launched in 2014, and our project was restarted with the current project name, Constellation of the Earth. The new SAR has performed as expected in our project thus far. Since weather is not a concern, we can invite a large number of participants to the project and achieve large “constellations” via the many reflectors placed by each participant. For example, in the Ibaraki Kenpoku constellation drawn in August 2016, we created a constellation covering a large area of over 40 kilometers wide in the northern portion of Ibaraki Prefecture, Japan. SAR is the only method through which such wide images may be captured at a precise time and at once for an entire area with no impact from the weather. The basic motivation of this project is to share the experience of seeing ourselves from outer space as pictured not only by the artists but also by all of its participants. SAR realizes this goal. If the constellations drawn in our project are considered geoglyphs, a kind of painting, SAR may be considered a painting tool through which our paintings are drawing it. In the history of art, new technologies have consistently supported developments in new artistic expressions. We believe that SAR represents one such novel development. Explaining the complex mechanism of synthetic aperture radar (SAR), which takes images of the ground using invisible radio waves, is difficult to achieve using simple sentences. The basic concept is simply a repetition of transmission and reception of radio waves. The antenna of the radar emits a short pulse wave of several nanoseconds and illuminates the ground surface for a moment. Then, the same antenna receives the reflected waves that return to the satellite after striking the ground surface. This process of transmission and reception is repeated at rapid intervals of several thousand times per second while the instrument flies at high speed aboard the satellite. The cycle of emitting and receiving radio waves against the ground is analogous to throwing a ball to the ground and then picking it up after it bounces. At first glance, only zero dimension data, or “point” data, of the ground surface where the ball bounces against it are obtained. However, radio waves are not solid balls but a phenomenon that spreads like ripples on a water surface. Among the radio waves spread over a wide area on the ground, reflected waves striking a location farther from the satellite propagate over a longer distance and are received with greater delays. Therefore, even if the wave was but a single short pulse at transmission, the many waves reflected from different places on the ground are received at different times, similar to multiple echoes from different mountains that can be heard when making a loud sound among mountains. Thus, data obtained by one cycle of transmission and reception are not point data but one-dimensional, or “line,” data, which involve a set of many “points” corresponding to different distances. SAR repeats this cycle while traveling aboard the satellite. Similar to a copy machine moving linear sensors to scan a paper, repeating one-dimensional observations on a moving platform results in two-dimensional, or “image,” data. Looking closely at the details of a SAR image, we can see that it is composed of a set of myriad “points.” Objects reflecting radio waves, such as trees and poles on the ground, appear as individual points; when the image is viewed from a distance, however, a satellite image resembling a pointillism painting is seen. In Constellation of the Earth, participants draw intentional points in the SAR image by placing reflectors on the ground. Thus, the points that exist only at that specific time and place are recorded as a SAR image. A point is a basic element of a painting, and each point in a painting records one moment to create a picture with many other points. This is the same in SAR imagery. Drawing geoglyphs using SAR serves to reaffirm the function of a point in paintings. Tom Van Sant’s art work Reflections from Earth (1980) can be regarded as a pioneering example of a geoglyph created using artificial satellites. Although the satellite used in this work was the LANDSAT-3 satellite, some documents insist that the LANDSAT-2 was used instead. What is the truth? Since satellite observation data are acquired at an exact date/time using detailed methods, the information holds value as historical material and is responsibly archived by the government or organization that owns the satellite. The original satellite data used in Van Sant’s work is maintained by the US Geological Survey and remains accessible. In a preliminary study, we investigated old satellite data used in previous art works and found an area where mirrors were deployed to reflect the sunlight and draw points in the LANDSAT-3 image captured on June 11, 1980. Since the shape of the reflecting points is identical to that in the original graphic published by Van Sant, LANDSAT-3 is the definitive answer to our question above. Interestingly, the reflecting mirrors appeared once more at a similar position in LANDSAT-2 images taken on June 20. The image obtained was poorer in quality and not published in any document. We thus conclude that Van Sant used both LANDSAT-2 and -3 to obtain images and then chose LANDSAT-3 images for his work, likely because of better image quality. The high archival property of earth observation data enables us to achieve this verification. Satellite art, such as those famous works exhibited in the 1980s by Tom Van Sant and Pierre Comte and our own project images, possess unique archival property in that the original satellite data are permanently stored by the government or other related organizations even without the artists’ awareness. This is a common characteristic of media arts that utilize space infrastructures equipped with both function for gathering and archiving data. In the modern age, various space infrastructures are developed and utilized, but we rarely experience this equipment sensuously in our daily life. In Constellation of the Earth, participants attend a preliminary presentation on how and when they will be captured by satellite images, and they prepare for and obtain a real experience of image acquisition by satellite. One of the other aims of our project is to help expand the human perspective and thought process through this experience. In science, new findings should be repeatable, and researchers are required to publish their methods of experiments or calculations in their papers. If the same results can be achieved by others using the same method, the certainty of the findings can be confirmed. Also, if one can improve a published method and obtain novel results, the knowledge obtained can be regarded as a new finding. Using this methodology, humans have accumulated scientific knowledge and obtained a better understanding of nature, which has allowed them to utilize it successfully. Art is similar to science in its necessity of novel works based on accumulated concepts and methods. However, from the viewpoint of repeatability, art often presents different values from science. In most cases, art works and their production processes cannot be repeated by others or even by the same artist. We believe that what happens in a single time and place is confined to the work created at that time; thus, eventuality can be included in the value of the work. One of the goals of Constellation of the Earth is to share a new perspective from outer space with many people. To achieve this, how to manufacture and deploy the reflectors is described in a manual so that anyone can place a reflector on the ground. In methods describing the process of translating the original satellite data into an artistic graphic, certain procedures, such as obtaining the difference between two images taken on days with and without reflectors to extract only “changes” in the images, are described. In this respect, this project includes repeatability. The constellation drawn on the ground in our project is not a reproduction of the shape of a known constellation in the sky. In our project, the location of each star, such as a park or the ground, is determined by participants as a suitable place for deploying a reflector. Therefore, the shape of the constellation completely depends on what happens in the city. In addition, countless stars making up a “starry sky” also appear in the background of the constellation by various changes in the city, and this has also coincidental distribution. Constellations with the name of the location, e.g., the Tanegashima constellation (Tanegashima is an island where the work was created) can only been created at that specific time and place. In this context, this project presents eventuality. Thus, in this project, repeatability and eventuality in the scientific and artistic terms, respectively, coexist in our works and their production processes. This context is proof that science and art are in close conjunction in our project. Opportunities to view satellite images are common in our daily life, owing to Google Earth and online map services, but these satellite images are usually taken without being recognized by users. We do not, and need not, care about when and how these images were captured. Thus, most people, except astronauts and other scientists, never experience the viewpoint of the Earth as seen from space. In Constellation of the Earth, we perform creation activities on the ground that are captured by the satellite, and the moment that “we are now being seen from space” is shared with participants and recorded in an image. Unlike watching satellite images passively on map services, our project actively involves participants in satellite image acquisition. According to the questionnaires collected from the participants in our project, our participants, who come from a wide range of age groups and backgrounds, are generally satisfied with the activity and have gained interest in space development, the global environment, and the future of humanity, among others. They are thought to have participated in our project with interests of either science or art. As a result, our project satisfies various interests and encourages participants to expand their interest in science to art and vice versa. To convey this achievement to other viewers, we exhibited photographs capturing the creation process of our works, the reflectors and other items used in each work, and the resulting graphics of the constellations. In addition, several symposia were held to discuss our project. In one of these events, Symposium – Artistic Expression and Artificial Satellites held in August 2015, experts from various fields gave their opinions for our project. Besides specialists in art and aesthetics, a coordinator of an art project and a public relations officer from the JAXA gave talks from the viewpoints of practical workers from the arts and science, and both speakers opined that this project has potential to change social recognition by waking the participants and viewers to the viewpoint from space. As an achievement of our project, we can confirm that science and technology may function as an introduction to art and vice versa. We feel that science technology and art are mutually part of each other and that this cross-interaction can bring changes to society. Science technology and art have coexisted in the same field and cause the same behaviors despite differences in their methodologies, and both concepts have contributed immensely to human society. We wish to continue Constellation of the Earth project as an activity to visualize this function of science, technology, and art. (Earth Observation from Space), edited and published by ERSDAC. Earth” Project, Journal of the Remote Sensing Society of Japan, 36-4, pp. 367-372.